Faksa, Klingberg to Join Texas This Week; Others Coming? Mark Stepneski reported today that Czech forward Radek Faksa and Swedish defenseman John Klingberg will both join the Texas Stars this week. The two were drafted by Dallas and have completed their seasons with their respective clubs in the OHL and SHL. Faksa played two games last year on a brief assignment and Klingberg one in the playoffs. Others who may be joining the ATO-type crew this year include Cody Payne and Branden Troock. Payne's Saginaw Spirit were eliminated from the playoffs last week by the Erie Otters. Troock's Thunderbirds made it through to the second round in the WHL but will face top-seeded Kelowna. Edit: Facebook commenter Chad Turley pointed out that Gemel Smith is done with his eligibility this season as well. 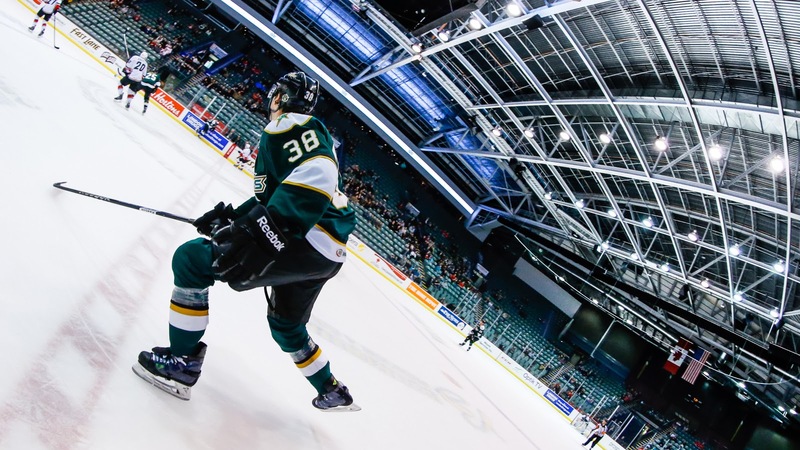 His London Knights are into the second round of the OHL playoffs against the Guelph Storm. However, even if they lose out, London is hosting the Memorial Cup this year and gets an automatic bid as a result. We shouldn't expect to see Smith this year. The Memorial Cup ends May 26th. After being passed over due to injury at least twice in his time with Texas, Patrik Nemeth has been called up by the Dallas Stars this morning. Nemeth is the team-leader in plus/minus at plus-19 and has picked up his offense recently with a total of 3 goals and 7 assists. Reports indicate Nemeth will play tomorrow against the Washington Capitals. The Texas Stars, proud American Hockey League affiliate of the Dallas Stars, announced today that Dallas has recalled defenseman Patrik Nemeth from loan with Texas. Nemeth, 22, has posted 10 points (3 goals, 7 assists) and a team leading +19 plus/minus rating in 37 games played for Texas this season. The native of Stockholm, Sweden is in his second North American professional hockey season, where he has earned 22 points (4 goals, 18 assists) in 84 career AHL contests. Since returning to the lineup following a two-month injury stint on February 15th, Nemeth has posted eight points (3 goals, 5 assists) and a +13 rating in 17 games played. The 6-foot-3, 235-pound defenseman was drafted by Dallas in the second round (41st overall) of the 2010 NHL Draft and was signed to a three-year, entry-level contract on April 21, 2011. The Dallas Stars return to the ice on Tuesday, April 1st for a 6:00 p.m. CT game against the Washington Capitals at Verizon Center. Thanks to a win by Toronto last night over Abbotsford, the Texas Stars sealed up a second straight division title. With a current point total of 95 and Abbotsford's max at 95, Texas held the tiebreaker of regulation and overtime wins. The Heat cannot catch the Stars on ROW and therefore are the division champs. Texas has the week off before playing two home contests against the Lake Erie Monsters this weekend. Hubert Labrie célèbre son deuxième but de la saison. The Texas Stars set a franchise-record this evening with their seventh straight win, tonight putting up six goals against the Hamilton Bulldogs. Six different Stars scored in the game. "It's in our game plan to bring the puck to the net, be ready for rebounds," said Hubert Labrie, who had a goal, assist and a fight in the game. "Just bring the puck to the net because you never know what can happen." Labrie was one of six players with multi-point nights. Travis Morin added two assists to become the first Texas Star in franchise history to score 80 points in a season. He leads the AHL in scoring. The Stars were one for three on the power play and perfect 5-for-5 on the penalty kill. Cristopher Nilstorp got the start and sealed up 24 of 25 shots against him. The Stars got off to a quick start in the first period. Travis Morin got the play started below the goal line with a pass out to Derek Hulak in the slot. Curtis McKenzie scored off the rebound of Hulak's shot, which bounced out to him clean on the right wing side. The Stars led on shots 11-1 after the goal. Coach Willie Desjardins slid Hulak in on the first line tonight as a tryout, which he did well in. "Hulak's got some speed, and he's a little older than guys out of junior," said Desjardins "He's a smart player and makes some good plays. I'm just trying to find a spot for him. I don't know where he'll fit in but I wanted to try him with Morin." Patrik Nemeth continued his recent scoring streak from a new area of the ice. With a delayed penalty coming on the Bulldogs, the defenseman snuck down low on the right wing side. Brendan Ranford found the Swede for a one-timer to make it 2-0. Fellow blue liner Jyrki Jokipakka had the second assist. "Jokipakka made a good play behind the net to see me. I was looking for something," said Ranford. "It was funny that Nemeth was back door there but 6-on-5 you're getting to the open ice as much as you can. It was a nice play by him." By the end of the period, Texas led on shots at 20-3. Penalty spill over from the end of the first combined with minors from both teams in the second to equal some power play time for the Stars. Matej Stransky made it count with a two-man advantage PPG, putting Texas up 3-0. The Bulldogs caught up on shots with two power play chances in the period. They broke up the shutout bid off that momentum with Thomas putting in Hamilton's first goal of the week against Texas. Nearly immediately, the Dowling line charged in low and generated a goal to regain the three tally advantage. Dowling slipped the puck out to Labrie at the point. Labrie blasted the puck past Tokarski with Hedden and Ritchie screening the net. Despite not playing since March 8th, Labrie had no rust in his play. "He's always the same," said Desjardins. "Every day is the same in practice, in games. He has a lot of confidence and he's well liked on the team." The Stars polished off the night with two more in the final frame. As time wound down, Texas found itself on the PK and Hamilton pulled Tokarski for the 6-on-4 adnvantage. It was the Stars taking the advantage though as Ranford scored his 12th of the year into the empty net shorthanded. "I was just trying to get it down the ice. Most the time you want to get it up the ice because the guys are on the wall. It just ended up going in." Mike Hedden finished up the night with his 22nd of the season, a nice breakaway effort with less than a minute left, which he slipped in five-hole on Tokarski. Ritchie and Nemeth assisted. * - Chris Mueller was assigned to Texas in the middle of the game. Fresh off signing an entry level contract with Dallas, left wing Alex Guptill has signed an amateur tryout agreement with the Texas Stars and should join the team in time for tomorrow's game against Hamilton. Guptill just conmpeted his junior year at Michigan. 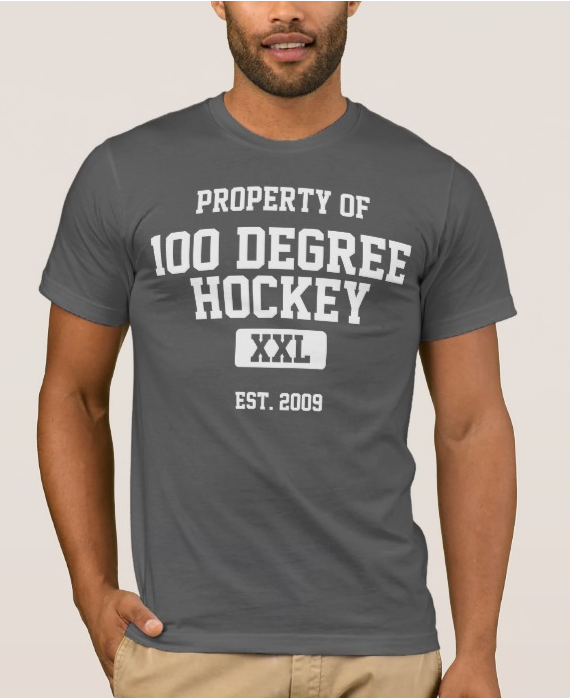 He scored 44 goals and 50 assists in his 110 game collegiate career. He was a third round pick of the Dallas Stars in 2010. Guptill will wear #37 for Texas. Chris Culligan, Jeff May and Brad Lukowich previously wore #37. Based on the willingness of Coach Desjardins to put Chris Culligan and Derek Hulak into the lineup this season, Guptill may play as early as tomorrow. 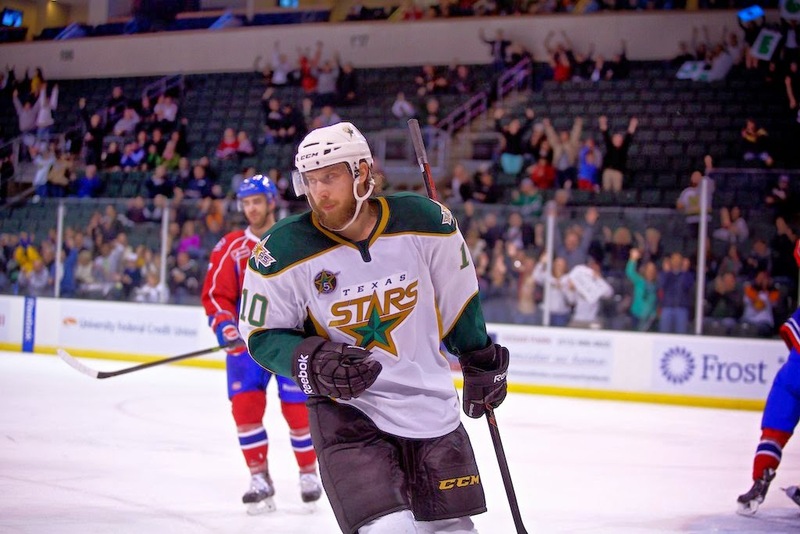 The Texas Stars, proud American Hockey League affiliate of the Dallas Stars, announced today that the club has signed left wing Alex Guptill to an amateur tryout contract. Guptill, 22, just completed his junior year with the University of Michigan of the Big 10 Conference, where he finished fourth on the Wolverines with 25 points (12 goals, 13 assists) and 20 penalty minutes in 31 games played. In three seasons with Michigan, the native of Newmarket, Ontario posted 94 points (44 goals, 50 assists) in 110 games. During his freshman campaign (2011-12), Guptill was named the CCHA Rookie of the Year and was also named to the CCHA All-Rookie Team after posting 33 points (16 goals, 17 assists) in 41 contests. The 6-foot-3, 190-pound forward was selected by Dallas in the third round (77th overall) in the 2010 NHL Draft and signed a two-year entry-level contract with the Stars on March 27, 2014. Ed. Note: Tonight's game wasn't supposed to be a game. I had other plans previously made so I was unable to watch live. It was probably a quiet bus ride home after this one. The Stars got a 2-0 lead at puck drop and extended that to 3-0 on Derek Hulak's first pro goal. It wouldn't last as San Antonio scored three straight of their own to tie things up. Texas went back up on Derek Meech's slap shot in the third period. Wade Megan got it right back on the power play and the Stars would fail to score the rest of the way. Jack Campbell would take the game to the shootout with an amazing save late in OT. There, Matej Stransky was the only goal scorer for Texas. Jared Gomes won it in the fifth round for San Antonio. The Stars moved to 93 points on the season, best in the league, but still probably not what they'd hoped for from the evening. Derek Hulak scored on his very first shot of his AHL career and Brendan Ranford had three assists, but the Texas Stars squandered a 3-0 lead and fell to the San Antonio Rampage 5-4 in a shootout Thursday night at AT&T Center. By earning a point in the game, Texas improve to an AHL-best 93 points on the season. The game resumed with 12:01 remaining in the first period and a 2-0 Texas lead, with goals scored on March 1st by Scott Glennie at 0:57 and Curtis McKenzie at 3:06. When play got back underway there were 13 players missing from the original lineups, with the Stars missing five and the Rampage missing eight. Left wing Derek Hulak, who was making his AHL debut, got things going at 13:46 when he scored on his first career AHL shot, taking a beautiful cross-ice pass from rookie Brendan Ranford and beating goalie Scott Clemmensen for a 3-0 lead. San Antonio got on the board at 16:11 when Wade Megan tipped a Mike Mottau shot from the blue line down and through the legs of Jack Campbell for a power play goal. The Rampage crept closer in the second period. John McFarland stole the puck away from Matej Stransky and skated in all along on Campbell. The Stars’ goaltender made the initial save with his left pad, but with no defenders to clear out, McFarland had an unimpeded second effort and tucked his shot around Campbell at 6:09. San Antonio tied the game at three just 4:09 into the third period when Jed Ortmeyer tipped and John Lee slap shot passed Campbell for the home team’s third straight goal. With just under seven minutes left in regulation, defenseman Derek Meech took a pass from Ranford and had all kinds of space in front of him. Meech walked the puck into the slot and crushed a slap shot into the top left corner of the net, beating Clemmensen for his second goal of the season at 13:02, putting Texas ahead 4-3. Ranford notched his third assist of the game on that goal, while Taylor Vause picked up the second assist. The lead would last just 70 seconds as Megan slammed in a rebound at 14:12 for his second power play goal of the night, tying the game at four. The Stars were whistled for too-many men early in overtime, giving San Antonio a four-on-three power play. Texas killed off the infraction, but still need a sensational glove save by Campbell as time expired in the extra session to reach the shootout. Matej Stransky gave the Stars the lead with a goal in the first round of the shootout, but Anthony Luciani tied things in the third round and Jared Gomes scored in the fifth round to win the game for the Rampage 5-4. Scott Clemmensen (3-5-0) stopped 23-of-25 shots in the game and 4-of-5 in the shootout to record his third win of the season in goal for San Antonio. Jacob Markstrom, who started the game on March 1st, but was traded to Vancouver on March 5th, allowed two goals on four shots in the first 7:59 of action. Jack Campbell (10-1-1) suffered his first shootout loss in goal for Texas this year, finishing with 20 saves on 24 shots and stopped 3-of-5 in the shootout. The Stars out-shot the Rampage 29-25 in the game and did not have a power play for the first time this season; San Antonio was 2-for-4 with the man-advantage. If nothing else, this game will be an interesting story. You won't find this evening's game on the Stars' schedule magnet or any of the preseason information because it wasn't supposed to happen. Well, at least it wasn't supposed to happen tonight. The game was supposed to be completed March 1st. Tonight's game is, of course, the completion of the game suspended for poor ice conditions in San Antonio. You can read about the original game and the circumstances here. The game this evening will start with 12:59 remaining in the first period. Texas will sport a 2-0 lead thanks to goals from Scott Glennie and Curtis McKenzie. Jack Campbell will probably be in net for Texas. Oddly, Jacob Markstrom will not. He was traded by the Panthers to Vancouver at the deadline and may retroactively see himself tagged with a loss if the Stars win. Others on the game sheet that will not be in attendance for the resumed game include Colton Sceviour, Francis Wathier, Dustin Jeffrey and Vincent Trocheck. Not to mention the attendance. The original game was certainly going to be one of the best attended of the season for the Rampage. It was a Saturday and the first game back after the rodeo trip. It was also military appreciation night. Will those fans return for the restarted game on a Thursday? To be sure, it will be a messy postgame stat sheet. 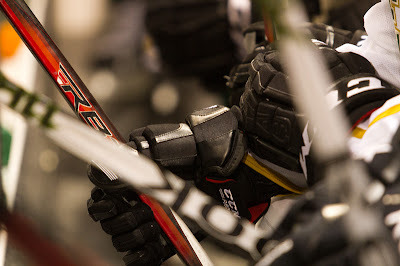 When this game was originally set to be played, the Rampage were in pole position for the eighth playoff spot. They were ninth in the conference with a lot of home ice ahead of them. Since the game was called, the team has gone 2-7-0-1, sinking them to 14th in the conference and probably out of a playoff spot. Texas on the other hand went 9-1-0-0. The Stars are currently riding a franchise-record six game winning streak. This game will not count toward that streak though. All stats will be recorded as if they occurred on March 1st. A win could extend their road win streak to six and their road point streak to eight by adding to the front and middle of each, respectively. To a man, the Stars are not preparing for or thinking about this game any differently. Coach Desjardins was stern in reminding the media that the 2-0 lead means almost nothing if they let the Rampage score one quickly to put Texas on its heels. There's no momentum echoing across the 26 days from those two goals. The Dallas Stars have announced today that Justin Dowling has been signed to a two-year contract by the club. The terms of the deal were not announced, but it is reaosnable to assume that it is a two-way deal in both years. 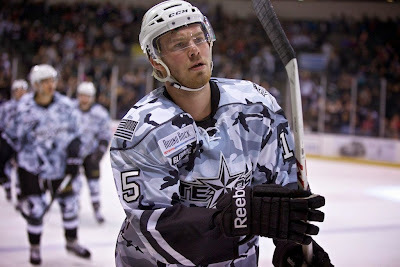 Dowling came to Texas after signing with the Idaho Steelheads last year and playing there during the lockout, earning himself an ECHL All-Star nod. He potted 16 goals and 14 assists in 38 games as a key part of the team down the stretch. This year, he's on a current hot streak with four goals in the past two games. 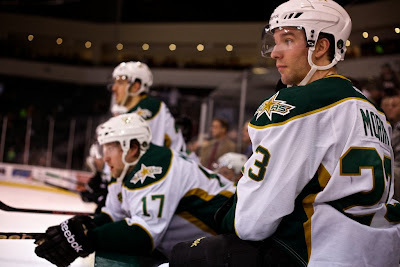 The Texas Stars also made the signing of Derek Hulak official in the same release. The Texas Stars, proud American Hockey League affiliate of the Dallas Stars, announced today that Dallas has signed center Justin Dowling to a two-year contract commencing for the 2014-15 season. Texas also announced that the club has signed left wing Derek Hulak to a professional tryout contract. Dowling, 23, is in his third full professional hockey season and his second with Texas. The 5-foot-10, 185-pound forward has posted a career-high 39 points (9 goals, 30 assists) in 66 games with Texas this season, as well as a +12 plus-minus rating and 138 shots on goal. Last season during the 2013 Calder Cup Playoffs, the native of Cochrane, Alberta finished tied for second on the Texas Stars with four points in nine games (1 goal, 3 assists). 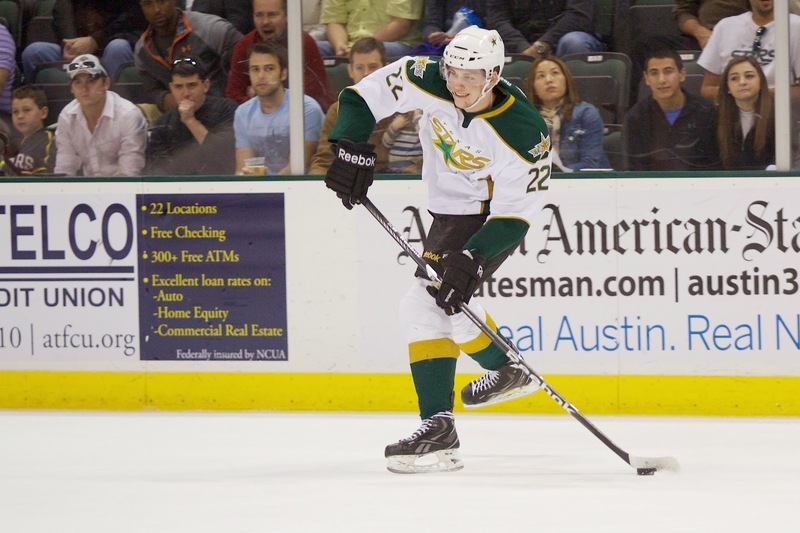 Dowling went undrafted and was initially signed by the Texas Stars to an AHL contract on Jan. 7, 2013. In 194 career pro games, including 134 in the AHL, he has 145 points (46 goals, 99 assists) and 38 penalty minutes. Hulak, 24, just completed his fourth season of CIS hockey with the University of Saskatchewan of the Canada West Universities Athletic Association (CWUAA). The Saskatoon, Saskatchewan native had 48 points (13 goals, 35 assists) and 12 penalty minutes in 28 games, leading the Huskies in both assists and points. Hulak helped Saskatchewan reach the championship game of the 2014 University Cup and scored the Huskies’ only goal in a 3-1 loss to the University of Alberta. His six points (4 goals, 2 assists) in three games earned him the University Cup Tournament MVP honors. He was also the 2013-14 Canada West Player of the Year, a 2013-14 CWUAA First Team All-Star and he won the Dave “Sweeney” Schriner Scoring Trophy. Hulak made his professional debut with the Tulsa Oilers of the CHL during the 2010-11 season, before elected to play for the University of Saskatchewan. Prior to that he played four full seasons of major junior hockey in the Western Hockey League for the Regina Pats and the Saskatoon Blades. In 267 career WHL games, Hulak had 242 points (95 goals, 147 assists) and 183 penalty minutes. 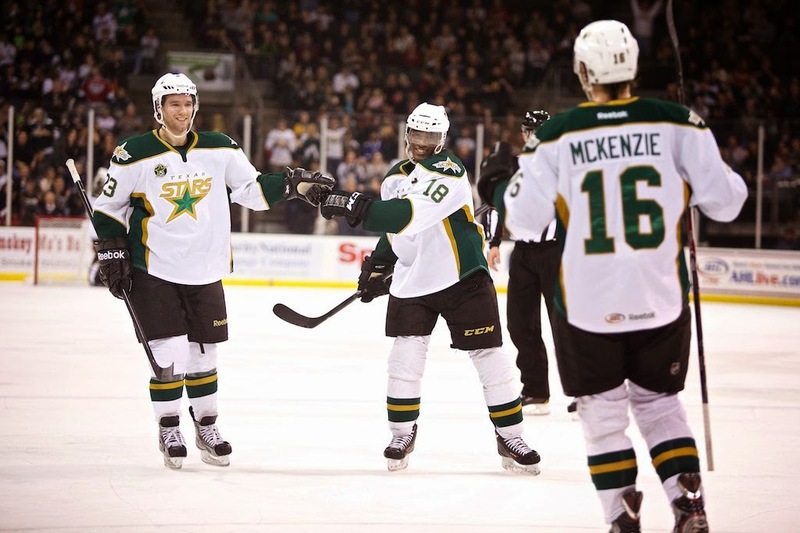 Having just secured their playoff spot, the Texas Stars did not rest on their laurels as they smashed the Hamilton Bulldogs tonight in Cedar Park by a 4-0 mark. Justin Dowling continued his hot streak with two more goals in tonight's game to add to two in Saturday's contest. "I'm just starting to get a couple lucky breaks," said the second-year Star who has now found the net nine times on the season. Linemate Brett Ritchie had two assists in the game and added, "Everybody's a bit streaky. You knew he was going to break out at some point. As long as one of us is putting it in, it doesn't matter." Texas controlled the play throughout but did not open the scoring until the second period. The Morin line was held scoreless in the contest, but every other line tallied a goal. Scott Glennie and Taylor Peters were the goal scorers. "[That depth] makes a big difference," said Coach Desjardins. "In the playoffs, they'll match their big D up to shut down your one line. It helps going into the playoffs to have more than one line." The Stars pushed their point total to 92, tying them for first place in the league with Manchester. The win was their sixth in a row, tying a franchise record set earlier this season. Cristopher Nilstorp pitched a relaxed 20-save shutout, helping Texas stay in it with some big saves in the first. After a very quick first period, Texas opened the scoring in the second period with a solid play by the rookie Ritchie. The eventual goal scorer, Dowling, sets up the play. "Ritchie made a great play. He was walking down the wall there and saw me cross ice. He made a great pass under two sticks. I didn't get much on the shot. The guy slashed my stick on the follow-through so it was more of a change-up." The puck fluttered by Dubnyk blocker side for the 1-0 lead halfway through the period and the game. Taylor Peters put up his seventh of the year just five minutes later off a one-timer on the pass from Matej Stransky. Dowling tallied his second of the night and fourth in two games as the third period began. "On the second goal, the puck was just laying there after Ritchie drove the net hard. He's a big body and he gives D-men fits. He just drove the net hard and took two guys with him. I ended up alone with the puck." The tap-in goal gave Texas certain breathing room and put the goal of getting the shutout for Nilstorp as top priority. Scott Glennie tallied his thirteenth of the year halfway through the period, finishing in tight on a pass from Patrik Nemeth. Nemeth was plus-4 on the night, bringing his plus/minus to a team-leading plus-17. The closest Stars behind him are Morin and Gaunce at plus-13 each. Texas will now travel to San Antonio on Thursday to complete the unfinished game from March 1st. Having just sealed up a playoff bid, Texas will close out their season series with the Hamilton Bulldogs with two games this week at the Cedar Park Center. Originally those games were to be uninterrupted, giving Texas three days off between contests. Thanks to the bad ice condition game in San Antonio, the Stars will travel to the AT&T Center on Thursday to finish up that game. The Bulldogs come to town on a season-high nine game road stretch. The stint will see them play in Texas, Oklahoma, Michigan and Newfoundland before returning home on April 12th. It's a tough road to hoe if the Bulldogs have their eyes set on the playoffs. With 12 games left to play, it looks like they will need 22 points to get into the dance. That's an 11-1-0 record. They won't be eliminated this week officially, but wins by Texas (twice) and San Antonio this week would probably put the second to last nail in the coffin. Texas is in an interesting spot as they approach the playoffs. 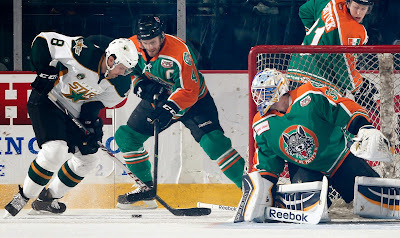 Last year the team clinched a playoff berth on April 7th thanks to a win by the Chicago Wolves. After that date, the Stars went 3-3-0. Among those two wins were an OT win against playoff-bound Charlotte and a shootout win against non-playoff bound San Antonio. Just before clinching, the Stars had two bad losses to OKC and Hamilton. In both games, the Stars lost on goals scored in the last minute of the game. Many Texas fans remember those two. 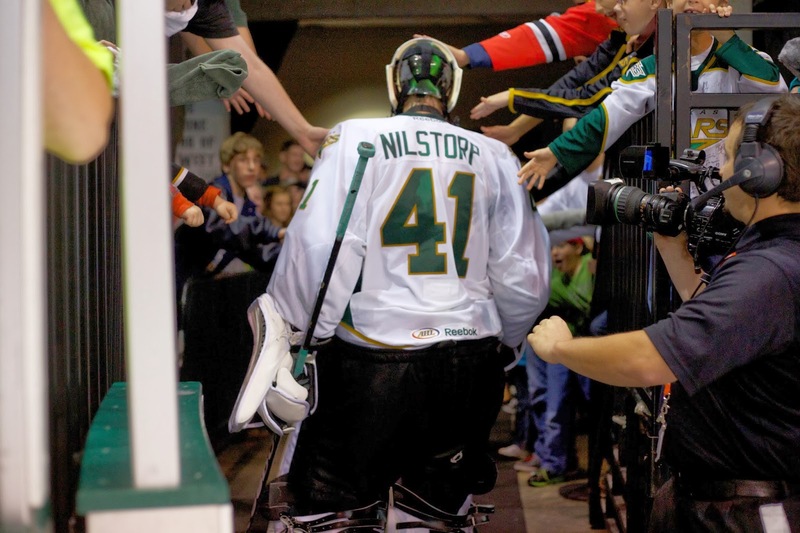 Eventual playoff starter Cristopher Nilstorp had a 3.23 GAA and .893 SV% in the month of April last year. The team just seemed out of sorts. It was not a good combination for Texas, which stumbled into the playoffs with a pair of home losses. Now that the playoff bid is secure, there's no time to let up. While the Texas Stars were surely out enjoying a wonderful Sunday afternoon in Austin, the San Antonio Rampage defeated the Charlotte Checkers in North Carolina. Thanks to that result, the Texas Stars have clinched a spot in the Calder Cup Playoffs for the fourth time in the team's five seasons. Charlotte was the last team of the bottom seven that could catch Texas' 90 point mark. With the loss, the Checkers maximum point total sits at 89. If Grand Rapids defeats Chicago today in any form, they will also reach 90 points and clinch their spot in the playoffs just behind Texas. The Stars have the current tie breaker advantage on the Griffins with 39 regulation and overtime wins compared to Grand Rapids' 37. 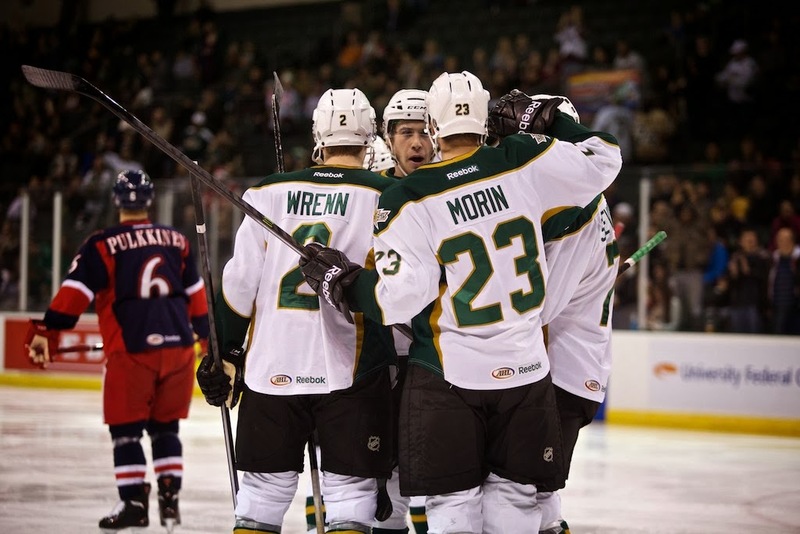 For the second night in a row, it felt like playoff hockey in Cedar Park for the Texas Stars. Once again, it was the Stars walking away with two points, thanks to two goals each from centermen Justin Dowling and Travis Morin. "It was a tough game all the way along," said Texas coach Willie Desjardins. "We played hard and Oklahoma City played hard as well. It could have gone either way." After going down by two in the first period, the Stars battled back in the second period to end forty tied at two a piece. "We have a lot of scoring power on the team," said Justin Dowling. "We're always confident we can come back no matter what the score. We treat each period the same." Dowling was that scoring power tonight in the third period as his pair of goals to push Texas ahead 3-2 and 4-3 were huge. Coach Desjardins commented on the scoring balance the team enjoys. After Jeffrey and Glennie keyed the offense last night, Morin and Dowling made the difference tonight. "It's nice to have. I think you need more bounces as you go towards the playoffs. It takes guys off keying on Morin's line. Now they're looking at all the lines. You need those guys to be successful." One aspect of the game that certainly screamed playoffs was the physicality of the game. The two teams combined for 38 minutes of penalties solely in minors. Many were of the matching variety. As the third period rolled on, OKC took four straight minors late in the frame. Dowling capitalized just after the final power play expired. "The power play that we have, the more time we have the more chances we'll generate," he said. "Give us too many chances, the puck is eventually going to find the back of the net. On my goal, they were stuck out there for a while, and they were in scramble mode." Most of Texas' physical penalties were matching minors, which Coach Desjardins felt showed good discipline out of his club tonight. Jack Campbell improved to 10-1-0 on the season with the win. It was the first time he allowed more than two goals this season. The second-year goalie also took a minor in the second for roughing. Texas pulled into a tie for the league lead in points at 90. Manchester is the other club at 90. For the second night in a row, the Barons opened the scoring. Travis Ewanyk scored off a rebound of the Curtis Hamilton initial shot. Matt Ford extended the lead late in the period on another rebound goal, this time on the 5-on-3 power play. Texas went to the room down 2-0. Unlikely goal scorer Patrik Nemeth opened the scoring early in the second period. The puck slipped out to him at the left point and he blasted it past Brossoit with no traffic in front, just a simple slap shot that befuddled the Barons backstop. The Stars and Barons traded pleasantries as the period went on. The Barons charge on Campbell earned a solid punch to the head from the Michigan native. No power play resulted from the fracas. "They played hard and went hard," said Morin. "It was a physical game. We just stuck to our game plan and knew we could get it in the end." Morin contributed to that game plan with his 30th of the year next up. "I won the faceoff, and it didn't go much to my side. The puck coasted into the slot, and I managed to jump over and grab it. I had a point blank opportunity from the hash marks." He would not miss and put the Stars even at two all. Justin Dowling opened the third period on a nice individual play to put Texas up by one. With Brandon Davidson draped on him like a coat, he outlasted Brossoit on a semi-breakaway and tucked it home on the backhand. Andrew Miller scored three minutes later to keep up the seesaw battle at three all. Dowling again came up huge as the Stars' power play expired near the end of the third. From the right wing goal line, Dowling narrates the play. "I actually wasn't even trying to shoot it. I was trying to hit Ritchie on the backside. He snuck in behind the D. It was one of those nights. Luckily it went off their guys' shin pads and ended up going in." Up one, Texas locked it down. Morin added, "It's game awareness on the bench of how much time is left and not taking too many chances and playing smart situational hockey." Morin was the beneficiary of that situational play when he iced the game with an empty netter. The Stars are next in action on Tuesday against Hamilton. If last night was a playoff atmosphere, you better believe tonight will be. Texas can bring Jack Campbell in net but I'm not sure OKC brings anyone but Richard Bachman. Mark Arcobello and Roman Horak look to be out again, but did that matter last night? The Barons still scored three goals on Texas despite missing two big time scoring threats. Alex Lavoie scored his first AHL goal after being signed on a PTO Thursday. That's depth scoring. Same story as last night. Texas has to hope for a better result. Nothing wrong with two points, but giving one away isn't great. It's especially not great when those points could make these Barons a first round opponent in the Calder Cup Playoffs. It wasn't pretty, but two points is two points. After overcoming three separate one-goal deficits, Texas finally got the lead for good on Scott Glennie's OT winner. "I don't think that was one of our better games," said Glennie. "But I think we battled hard. It was playoff hockey tonight. It's good to know we can come back in the third and get wins like that because we're going to have to do that come playoff time." Missing some of their top firepower in Mark Arcobello and Roman Horak, the Barons showed no signs of distress in the scoring department. "They had a lot of guys out tonight," said Coach Willie Desjardins. "You have to commend them on how hard they worked. I think we were feeling the effects of coming off the road. We were tired." The power play was what kept Texas in it through out the game. 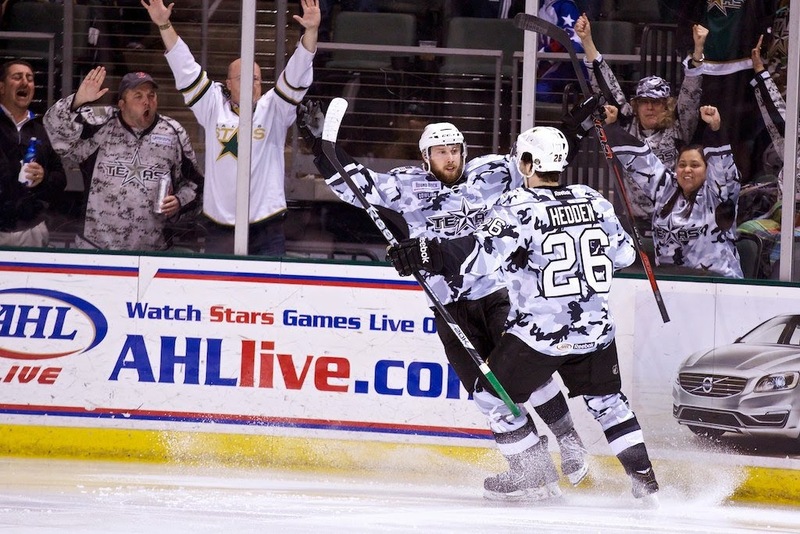 The Stars went 2-for-4 on the night on goals from Glennie and Dustin Jeffrey. That combo also put together the game-winning goal in OT. The playoff atmosphere of the game extended through the crowd and onto the ice, according to Brett Ritchie, who notched the game-tying goal in the third. "There were a few turnovers, but other than that, it was very tight. It was very intense." Cristopher Niltorp got the start and stopped 34 of 37 against. The Barons drew first blood as C.J. Stretch walked in past the Texas defense and backhanded one beyond a sprawling Nilstorp's reach. The Stars would even things up three minutes later on their first shot of the power play. Travis Morin fed the puck down low to Curtis McKenzie, who made some room for himself at the goal but then dished to Glennie on the far side for the easy tally. Just 29 seconds later, Matt Ford picked up a loose puck off a miscommunication between Jamie Oleksiak and Cameron Gaunce behind the net. The Texas power play activated again for the tying goal at two this time. Dustin Jeffrey with the turn-around shot got his fourth of the season, again on the power play with Leach in the box. Glennie added, "We're missing some guys [on the power play] but we still went 2-for-4. It wasn't the best job, but we'll take it." Within a minute, OKC had scored to go back up 3-2. The Stars went to the room after forty with a deficit thanks to Alex Lavoie's first AHL goal. "It was a pretty fast-paced game to start," said Brett Ritchie. "I don't think we played our best the first half of the game, but I think we settled in a bit and started taking it to them in the third period. You could sort of feel in the building that we were going to score." Ritchie was right, and he was the beneficiary. It's not like he wasn't trying before the third though. Ritchie tied his own franchise record for shots with ten in the game. Ritchie calls the play himself, "Someone threw it up to me there as I cut through the middle. I threw it to the net on my backhand. We had traffic and it happened to go in." The game went to OT as tensions continued to flare. Jeffrey and Glennie had been hot all night. It just figured they would combine for the winner. Glennie dropped the puck for Jeffrey, who fired it past Bachman off the tip from Glennie. "I think it bounced off my hip," said Glennie. "I'd have to watch the video. I'll take it. It wasn't designed. Me and Jeffrey will take anything we can get tonight. We're happy to have that goal." With two points, Texas is rewarded by staying in first place for another night. They gave up a point to the 9th ranked team, preventing them from clinching the playoffs this weekend. The Stars face the Barons again tomorrow. Time is running out for the Oklahoma City Barons to make their way into the Calder Cup Playoffs. But you better believe it, they aren't worried. This could be a first round playoff matchup, to be honest. The last time these two matched up the Barons were in 13th place. They sported a 17-22-1-5 record before two wins at Texas spurred a six game win streak and an eight game point streak. In all, since the Stars and OKC last played, the Barons are 10-4-0-2. That run has pushed then to ninth place, just three points behind the 8th place IceHogs. It's been accomplished on the backs of two players very familiar to the Cedar Park faithful: Mark Arcobello and Richard Bachman. Arcobello is a noted Star killer, better than a point per game against Texas in his career. Since being sent down by the Oilers, he has scored in every single one of the fifteen games he's played. In fact, Arcobello is on nearly a two point per game pace with ten goals and eighteen assists in just 15 games. he is a team-leading plus-11 and is seventh in team scoring despite only playing in a quarter of the Barons' games. Bachman has been the starter in all but one of the Barons' last 18 games. Tyler Bunz started the other game. He's in the ECHL now though and it's pretty clear his replacement, Laurent Brossoit, isn't getting any starts this weekend. Despite the fits he's given the Steelheads, he's 0-2 against Texas this year. The team is coming off back-to-back losses last weekend at Cox Convention Center against the Griffins. They were each one-goal losses though. It's something to hang your hat on, perhaps, but one-goal losses are worth the same as 10-goal losses in the standings: zero. Texas is 5-3-1-0 against OKC this year. They actually have a losing record in Texas over the last five years at 8-10-0-2. The Stars got out to an early lead but would need a pair of goals in the third to win tonight in Des Moines after giving up the lead in the second. 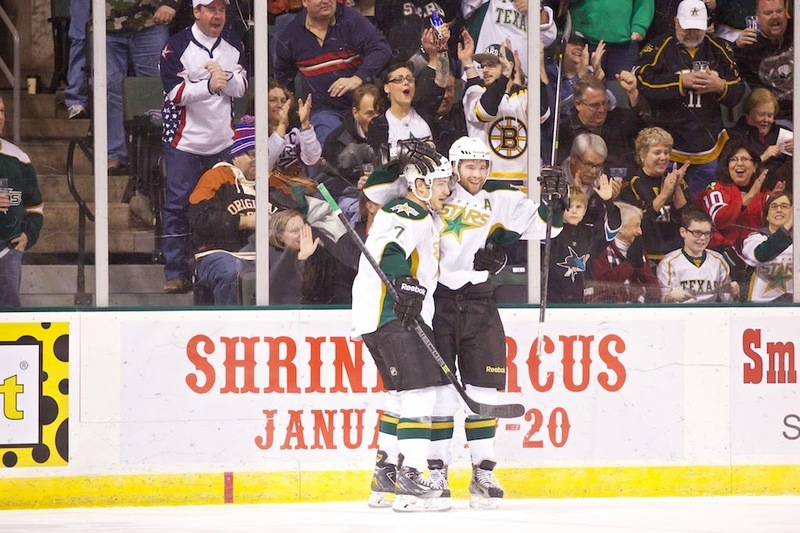 The rookies activated again as Brendan Ranford scored two goals and Brett Ritchie picked up the game winner. Kevin Henderson continued his excellent play since coming over from Milwaukee with his third goal and fifth point in three games. These two points put Texas in full possession of first place in the Western Conference. They are separated from Grand Rapids by two but the Griffins have a game in hand on the Stars. Grand Rapids does not play again until Friday. Jack Campbell allowed two goals, which actually raised his goals against. He moves to 9-1 and has still yet to allow more than two goals in a game on the season. Ranford got things started early for Texas with a quick play off the pass from Dustin Jeffrey at the right post. The goal came on Texas' first shot of the game. It was one of fifteen shots the Stars took in the first period, compared to the Wild's single shot. It was the lowest shots-against total for the Stars in a period all season. Jeffrey and Ranford combined again early in the second period to extend the lead to 2-0 on a close play down low. The Stars top ranked road PK took a hit in the second though as Brad Winchester scored his 18th goal of the year on the man-advantage off the centering pass from Zack Phillips. Two minutes before the end of the second, Brett Ritchie gave up the puck to Tyler Graovac in the Iowa zone. Graovac raced down on Jack Campbell and scored to even things up at two. Luckily for Ritchie, he would get a chance to turn from goat to savior with a late third period play by his centerman Justin Dowling. Ritchie tipped the centering pass from Dowling past Gustafsson for the 3-2 lead, one they would not relinquish. 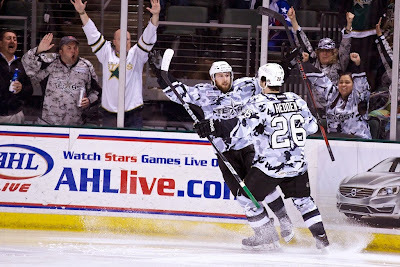 Kevin Henderson added his 10th of the season and third as a Star with 60 seconds left in the game. The tally came off a tip from the original shot from Cameron Gaunce. Travis Morin picked up his league-leading 75th point on the play. The Stars return home on Friday to face OKC. 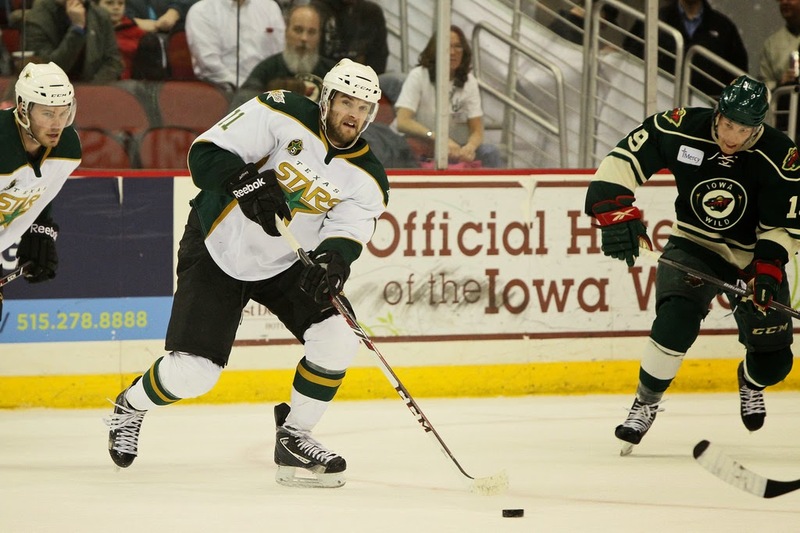 UPDATE: The Texas Stars have assigned Josh Robinson to Idaho this morning as well. Jack Campbell and Cristopher Nilstorp are the goalies for Texas. I'd challenge you to find a streakier team than this year's Iowa Wild. The Minnesota minor league affiliate is either the hottest team or the coldest depending on which week you're looking at the standings. After they beat Texas in the first meeting between the two team in November, the Stars won the next one, which set Iowa on 1-10-0 streak. The team dipped to five games below .500 at 8-13-1-0 with a December 11th loss to Abbotsford. Then something clicked. The Wild failed to get a point in just four their next 25 games, going 13-4-4-4. Then it went down the tubes. After a Justin Mercier goal beat Chicago in OT on February 7th, the next night saw the club shellacked by the IceHogs by an 8-3 score. That put them on a 1-8-1-0 run. They've just won their last three so maybe they're on one of those winning streaks again. If so, it couldn't come at a better time for Iowa. To have a chance at making the playoffs, the team needs 23 points in its last 16 games, or at least an 11-4-1 record. With six total games remaining against their division mates Chicago and Grand Rapids and one more against North Division leader Toronto, it's not looking so great for playoff hockey in Des Moines. All that being said, never say never. The Abbotsford Heat are falling fast and maybe that opens up another slot in the already packed playoff race. Cristopher Nilstorp is available and I'd put it at even odds as to whether he starts or Campbell gets the nod. Both are coming off a few days rest since their last outing. Nilstorp did mop up duty against Winnipeg on Sunday; Campbell started on Saturday against Chicago. Editor's note: This report was authored last Friday, before the Steelheads' games in southern California this weekend. They went 2-1 those games. It has been 18 games since the last Idaho Steelheads report and over that time the Steelheads have gone 9-9. There was one overtime loss and one shootout loss, but since the playoffs are determined by winning percentage, I just lumped them into the loss column for simplicities sake. Going into this week’s Southern California road-trip (Ontario and Bakersfield) the Steelheads have only won 3 of their last 10 games and at points have been struggling, but as I mentioned in the last report there are still signs that the team could make a late run if you can look past some of the numbers. We’ll take a look at all of the reasons I mentioned as to why the Steelheads can make a deep playoff, how they are going so far and what the outlook is for the remainder of the season and into the playoffs. The power play has 3 goals on 31 chances in 10 games (9.67%) not exactly going to be scaring anybody off with those number, however even though there is only 2 goals in the last 8 games (26 chances) on the advantage, the unit is starting to get some chances again. The unit has been missing players like Patrick Cullity and Tommy Grant, and don’t forget Brett Robinson has been out with an injury. Missing those key cogs for even a couple of games not to mention Robinson for all 10 games will impact a unit. This last weekend against Las Vegas at times the power play struggled, but at the same time, there were also chances a plenty and the unit still ranks in the top 5 in the ECHL at 17.9%. You don’t get there by accident and you don’t just all of the sudden forget how to score. With 12 games left in the regular season, I expect that the power play will get back to a percentage somewhere north of 15 and hopefully closer to 20 over the smaller sample size. On the flip side you have the penalty kill. The penalty kill over the last 10 games is 35-43 which is good for 81.4%. This number isn’t spectacular, but it isn’t dreadful either. The kill is still operating in the top 10 for the season at 84.9%. The biggest issue right now for the penalty kill unit is how much time they are spending on the ice per game. The Steelheads have allowed 43 chances over the last 10 games, after some simple math that works out to 4.3 power plays against per game in the last 10, if you convert that to minutes, you get 8 minutes and 18 seconds. When you flip it the other way and see that the Steelheads are earning slightly above 3 chances on the power play per game (6 minutes and 6 seconds), you are going to have some issues. If you want to put a positive spin on things, the Steelheads have had to deal with penalty issues all year long and they lead the league in PIMs with 1,217, which has a lead of 140 minutes on the next closest team (Utah 1,077), and they still have 30 wins on the season which doesn’t happen by accident. But you keep putting the same 8 to 10 guys out on the ice for that much time it starts to take away the ability for Brad Ralph to get all of his players ice time and could leave players on the bench for extended periods of time. Playing hockey that way, it is very hard to gain, or maintain any semblance of momentum. Penalties and how many are called against a team can be easily fixed. If a player can get to the correct side of the play so they don’t have to take a hook or hold that will help. Also, by earning more power plays with speed and aggressive forechecking will also limit the ability of your opponent to draw penalties. I would not be doing a fair evaluation if I did not mention the Steelheads have 10 shorthanded goals on the season, led by David de Kastrozza, so it’s not like the teams is taking 2 minutes off to relax. They do attack when the situation presents itself, and they do great job of cashing in when they attack. Defense wins championships, but I submit that balanced scoring can beat good defense. The first part of that is something that has been ingrained in all sports fans since they were able to figure out what was going on, but the second part refers specifically to the ECHL and the ability of teams to advance in the playoffs by virtue of balanced scoring through 3 lines come playoff time. Most teams at this level will have 1.5 solid defensive pairs, which leaves opportunities for your second and third lines to score. The Steelheads current roster have 10 players that have 20 or more points. Nine of those 10 are forwards and the 10th is Patrick Cullity (31 points) For those keeping track at home, you only dress 10 forwards on any given night so, quick math, your 3 lines will all have at least 60 combined points when they hop over the boards. Your 10th forward is Luke Judson who has 6 goals and 13 points in his 18 games played with Idaho. If that’s not scoring depth, I don’t know what is. The Steelheads also have 10 players with 10 goals or more on the season, which is also very impressive especially because some players that have 10 goals, don’t quite have 20 points yet due to time away from Idaho, so one would anticipate the number of 20 point players increasing over the last 12 games. Which leads to the next point, Justin Mercier is up in the AHL (10 goals, 18 points), Taylor Vause just got re-called to the AHL (10 goals, 15 points) and Austin Fyten up in the AHL (9 goals, 15 points) [Ed. Note: Mercier was returned this weekend]. That’s an entire AHL line that could be back in time for the playoffs. Then you take a look at what type of players they are, high energy with a physical presence, and there isn’t a team that will qualify for the playoffs that wouldn’t take any one of those players in a second. The scoring punch is, and will be there come playoff time, it’s just a matter of the team’s defensive play and goaltending cleaning a few things up before they get here in about a month. Here’s the payoff, are things all teddy bears and rainbows right now? No. Anyone within the organization will tell you that. Are they panicked? No. The message from the team has been that they all still believe in the player in the locker next to them. Will all the issues get figured out come playoff time? 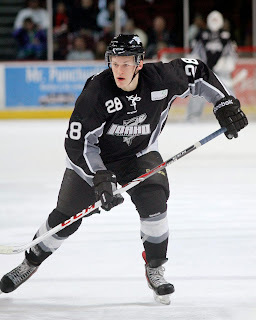 They have to, there is no other option for the Idaho Steelheads, a team and organization that demands and expects to be a Kelly Cup contender each and every season. I’m going to make this prediction right now. The end of the Steelheads season will happen 1 of 2 ways. First for whatever reason, things can’t get figured out and teams adjust to what the Steelheads are doing and the Steelheads get bounced in the first round of the playoffs. Or, they iron out a few details, start scoring more on the power play, start playing more disciplined and better team defense, and this team makes a run late into May. 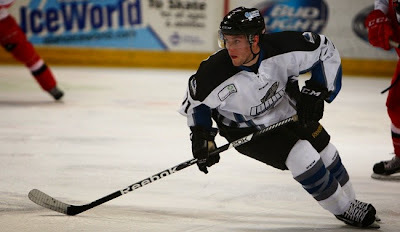 Based on the players that are in the Idaho dressing room and the competitive nature to win championships that they have, as well as the determination of Head Coach Brad Ralph and Assistant Coach Neil Graham to not allow this team to coast to the finish, I have full faith that the Steelheads will start to figure things out, and I’ll be writing more of these article late into May. The Texas Stars got the AHL's leading scorer back from the NHL's Dallas Stars this evening. Morin was in the NHL on emergency recall and the player that he was replacing, Cody Eakin, returned to the lineup tonight in Winnipeg. That means Morin had to be sent down or converted to a regular recall. NHL teams are only allowed four regular recalls after the NHL trade deadline. Morin collected his first NHL point on Friday against Calgary. He will join the team for their Wednesday game in Iowa, barring any further recalls. 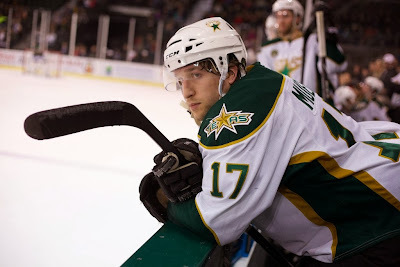 The Texas Stars, proud American Hockey League affiliate of the Dallas Stars, announced today that Dallas has returned center Travis Morin on loan to Texas. Morin, 30, is in his sixth season with the Stars organization and his ninth in professional hockey. In four games with Dallas this season, he has posted one assist and a +2 plus/minus rating. 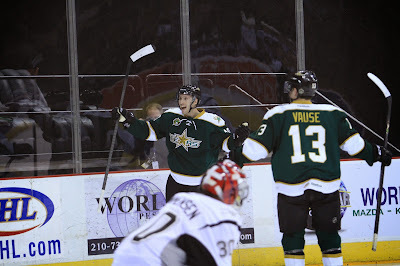 He leads the AHL with 74 points (29 goals, 45 assists) in 55 games for the Texas Stars this season. The 6-foot-1, 190-pound native of Brooklyn Park, Minnesota was originally selected by Washington in the ninth round (263rd overall) of the 2004 NHL Draft. He was signed by Dallas as a free agent on July 2, 2010. It would take overtime, but the Texas Stars managed to cap off their season series against the Wolves with a perfect 4-0 record. They moved back into first in the conference with the win, which was powered by two goals from new addition Kevin Henderson. Mike Hedden had the OT game winner off a pretty pass from Derek Meech. Josh Robinson got the start, his first since February 16th, and won with 23 saves on 25 shots. He was awarded the second star of the game for the effort. Texas was 0-for-6 on the power play but also held the Wolves without a power play goal on two chances. Chicago opened the scoring in this afternoon's game off a bad decision pass by rookie Star Chris Culligan. Texas was ready to break out but Culligan sent the puck up the ice where the pass was jumped by Sergey Andronov. Andronov easily sent it to Keith Aucoin on the left wing side. Josh Robinson had initially challenged Andronov and was completely out of the blue paint at the top of the crease. Aucoin had an easy shot at the open net for the 1-0 lead. It was the first lead for the Wolves in the season series. Just 46 seconds later, Henderson got started on his day. First he jumped onto the scoresheet with a good honest forechecking effort. The pressure down low by Henderson created an unforced error on the exchange behind the net between Jake Allen and Taylor Chorney. Henderson nabbed the puck and slipped it into the yawning net for the 1-1 tie. The Wolves appeared to retake their lead early in the second period on a cram play at the left post on Josh Robinson. The pyrotechnics went off and the goal song ensued at the Allstate Arena. However, the referees saw and the replay clearly showed that the Wolves had scored the goal with six men on the ice. With four at the blue line and two down low, Chicago was guilty of the too many men penalty, which negated the score. Texas would not score on that power play but would find the net three seconds after it expired. Jamie Oleksiak ringed the puck around the boards to Taylor Vause behind the net. Vause walked out on the right wing side and backhanded the puck over to Kevin Henderson in the slot for his second goal of the game. He beat Allen on the blocker side to score his fourth point as a Star, all against Chicago. Ty Rattie got his 24th of the year on a quick play from behind the net late in the third period. Texas failed to clear along the right wing board, allowing Andrew Bolduc to send a pass down to Nathan Longpre below the goal line. Longpre slipped the pass through Derek Meech and onto the stick of Ty Rattie, who put it far post on Robinson for the 2-2 tie. Scott Glennie was unable to get back into the play to lift the stick of Rattie on the play. The Stars would make it to overtime but wouldn't need much of it to collect the full two points. Justin Dowling collected the puck from a fallen Taylor Chorney. He walked it toward the net but passed out to Derek Meech at the hashes. Meech skated out toward the left side of Allen, pulling the goalie out of the net, and then passed it back to an unguarded Mike Hedden who deposited it into the open net. Texas plays in Iowa on Wednesday. It's been a while since the Texas Stars and Chicago Wolves faced off. The change to three divisions put Chicago and Texas in different divisions and moved many of their games off each other's schedule in favor of division opponents. Of course, the Wolves and Stars faced off in the second round of the 2010 Calder Cup Playoffs with Texas winning on a Game 7 overtime goal by then-rookie Jamie Benn. In the five year history between the two, not counting that playoff series, Texas holds the overall advantage at 15-8-1-0. This season, Texas has taken the two games already played, both at the Cedar Park Center. The two clubs will finish the season series with two games this weekend in Rosemont, Illinois. Early fair to middling results for the Wolves gave way to a mid-season renaissance that saw them vault up the standings. They are currently four points back of the Griffins with two games in hand. While the Griffins have yet to relinquish the division lead to the Wolves at any point yet this calendar year, Chicago is nipping at their heels. The Wolves are 7-2-1-0 in their last ten coming into tonight's game and have gone 23-6-4-0 since Texas beat them on December 13th at the CPC. AHL All-Star Jake Allen has been fueling that run from between the pipes. Allen is 26-13-2 on the season with a 2.09 GAA and .925 SV%. 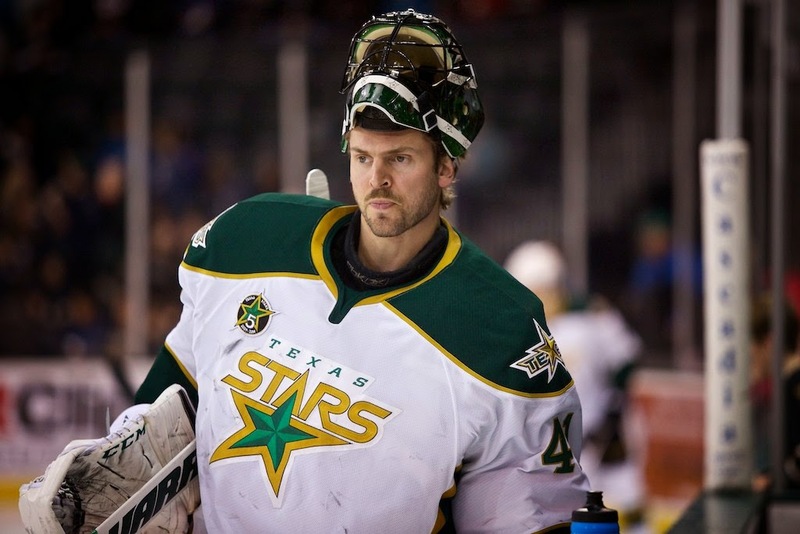 Former Texas Star Matt Climie is 8-9-0 but is 4-2 in his last six decisions. Allen is going to be a player at the NHL level soon but a goaltending logjam in St. Louis has kept him in the minors. If the Blues can re-sign Ryan Miller after this season, it may be time to jettison Brian Elliot and let Jake Allen own the backup role in the Gateway City. Allen's near two goals against suggests that the Wolves get it done on defense, which is true. They score 3.03 goals per game compared to Texas' 3.54. However, they also allow 2.49 per game compared to Texas' 2.77. Far and away the biggest offense force that the Wolves have to Ty Rattie. St. Louis' 32nd overall pick in the 2011 draft leads the club with 23 goals and 15 assists. The next-closest goal scorer is Dmitrij Jaskin at fifteen. The Stars will have to be disappointed if they don't come away from this one with a clean sheet on the PK. The Wolves are the league's worst power play overall at 12.7%. Texas, meanwhile, has very quietly snuck up to #1 in the league on the road PK at 88.5%. Newcomers Kevin Henderson and Chris Culligan joined the penalty kill unit for Doug Lidster this week, while the club also lost some of its skill killers in Morin and Sceviour. One of the big storylines for Texas will be how the lines gel together with a few more days to practice without Sceviour, Morin and Mueller in the lineup. It's hard to predict a top line but it was very encouraging to see that the play of Curtis McKenzie did not suffer for losing his standard linemates. He was just as much a force with Mueller and Stransky. That may be tested again though witht new linemates once more. Watch out for the two-way play on any of those lines heavy on rookies, of course. Charlotte's game winning goal Wednesday was the first professional minus for Chris Culligan. Morin and Sceviour will reunite in Dallas tonight. With Shawn Horcoff and Cody Eakin out for tonight's game against the Calgary Flames, the Dallas Stars have recalled Chris Mueller and Travis Morin from the Texas Stars. Travis Morin practiced on a line centering Colton Sceviour and Erik Cole in morning skate and is expected to play there tonight. Mueller lined up with with Ryan Garbutt and Ray Whitney. Travis Morin missed the Texas Stars' last game after his wife gave birth to their newest child, a son, on Tuesday night. Lucas Paul is the newest member of the Morin family. "We got home yesterday at 4:30 PM from the hospital and I was off [to go to Dallas] at 6:30," said Morin. "I finally got to rest a bit last night." he added, laughing. Morin and Sceviour are two of the top three leading scorers in the AHL and Dallas is hoping that their chemistry from Texas will combine with Erik Cole's goal scoring to big result tonight. "It's nice to have the familiarity [with Sceviour]. It makes it easier. Also, Cole definitely knows how to score in this league, so it's a huge plus to be playing with him." 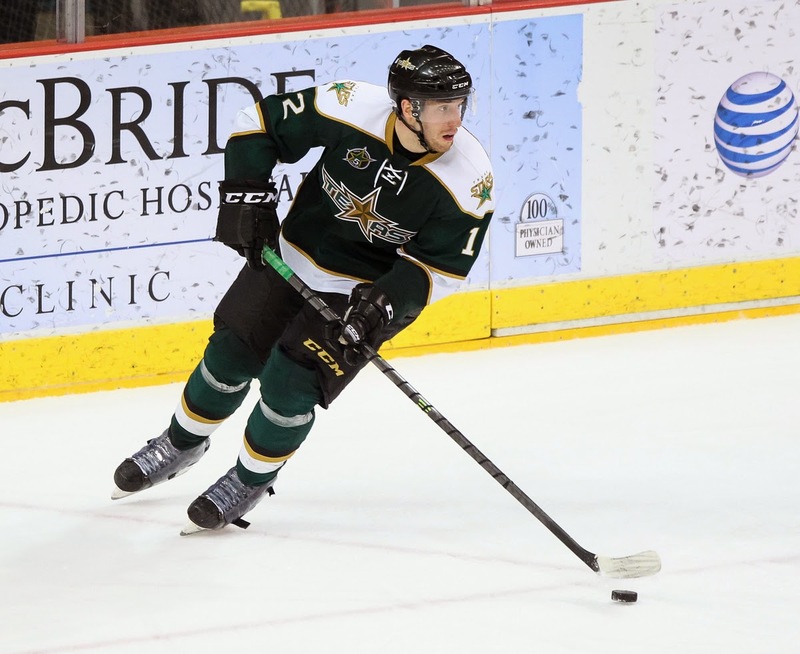 The Texas Stars have recalled Taylor Vause from the Idaho Steelheads to join the team on their trip to Chicago this weekend. Texas was riding with 13 forwards before the recall but Cody Eakin is potentially out for Dallas Friday night. Dallas is only carrying 12 forwards, necessitating a recall to fill out the needed 18 skaters. Although that recall hasn't happened yet, Texas is setting up for the potential dominoes of it as they head out on the road. The Texas Stars, proud American Hockey League affiliate of the Dallas Stars, announced today that the club has recalled center Taylor Vause from loan to the Idaho Steelheads, the team’s ECHL affiliate. Vause, 23, recovered from a long-term injury and was sent back to Idaho on March 5th, where he scored points in each of the four games he played for the Steelheads, piling up six points (4 goals, 2 assists) during that span. The Calgary, Alberta native has appeared in 12 games for Texas this season, recording two points (1 goal, 1 assist) and two penalty minutes. Vause has played in 21 ECHL games for Idaho this season, scoring 15 points (10 goals, 5 assists) and recording 10 penalty minutes. The second year forward has played in 72 career AHL games, all with the Stars, and has 21 points (6 goals, 15 assists) and eight penalty minutes. With the departure of Francis Wathier to the Milwaukee Admirals, the Texas Stars now have just three players remaining from their inaugural season. 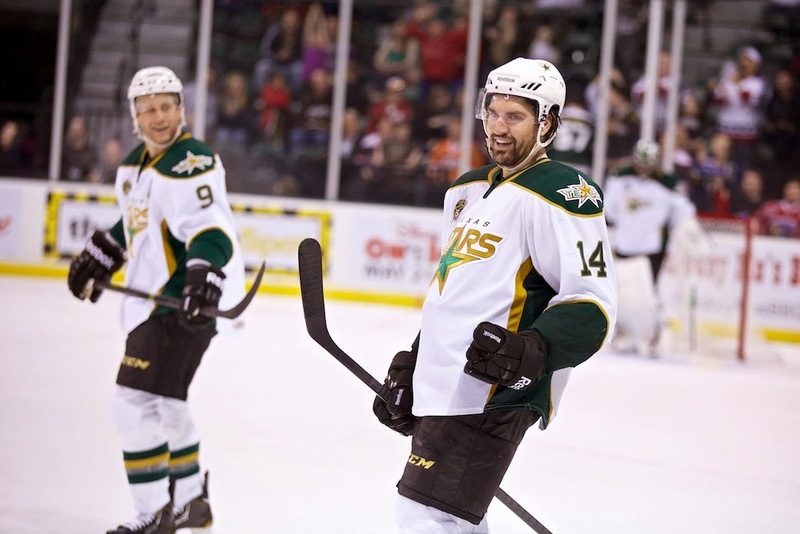 I asked on the 100 Degree Hockey Facebook page for fans to share their favorite memories of Wathier's time with the Texas Stars. The outpouring was enormous. "In arguably the best moment of the night, Luke Gazdic came out to congratulate Wathier on the fight as he exited the ice and entered the players' tunnel." Ross also recalled his OT goal against Toronto on November 3rd, 2011. Here's a shot of that moment, courtesy of Judy True. Bob Elliot waxed poetic on Wathier's constant energy. Fans agreed. His comment was the top liked comment in the thread. So many others in the thread remembered Wathier for the little things that he did around the ice and off the ice in the community. Al Hamilton seems to sum things up pretty well overall. Clearly he will be missed.